Electricity production from CHP units minimally increased in 2008 but was still far below the 2010 target. New impetus to this field is expected to come from the new incentives scheme in force since November 2009. The indicator shows the combined production of heat and electricity in Slovenia, which is one means of increasing the efficiency of electricity generation, as it makes use of the heat that is otherwise lost in conventional thermal power plants. Total heat is considered in heat production. Combined heat and electricity production increases the efficiency of electricity generation, as it makes use of the heat that is otherwise lost in conventional thermal power plants. A typical efficiency value for CHP is approximately between 80 % and 90 % for the combined heat and electricity generation, compared to a typical efficiency value for conventional thermal power plants of 35 % to 55 % (in Slovenia 30 %) and for heat up to 90 %. CHP units are often located close to heat and electricity consumers, limiting transmission and distribution losses. Total primary energy savings in cogeneration are thus between 10 % and 30 %. Additional environmental benefits can be realised by using low emission fuels such as natural gas or renewable energy sources. In 2008, electricity production from combined heat and power (CHP) amounted to 1106 GWh and heat production to 11,970 TJ. The share of electricity generated in CHP units in Slovenian gross production was 6.7 %. Compared to 2007, production was slightly less than 2 % higher and compared to 2002, 27 % lower. The higher production is the result of growth recorded up to 2005, while since that year, production has remained practically constant. The objective of the Resolution on the National Energy Programme is to double the production of electricity from CHP units in the 2000-2010 period from 800 GWh to 1600 GWh. Assuming a linear increase of production, the latter should stand at 1440 GWh in 2008 in order to meet this objective. This is over 30 % more than actual production in 2008. As evident from the figure, the gap from achieving target values of electricity production in CHP units continued to grow in 2008. CHP units are autoproducers, i.e. companies that produce electricity and/or heat in addition to their primary activity and public power plants, whose primary activity is the production of electricity and/or heat. They can be either private or public utilities. Autoproducers are mostly found in the final use sector, while public power plants in district heating. In 2008, autoproducers generated 244 GWh of electricity, which represents 22 % of total production. Since 2004, their share has been declining, which can be contributed also to the state’s modest facilitation of investments in new devices (poor operation of the system for the purchase of electricity at guaranteed prices for these devices). The capacity of CHP units did not substantially change in the 2002-2008 period, with the exception of the year 2006, when it amounted to 346 MW. In 2008, it decreased to 335 MW. Of course, this does not mean that there were no new units installed. These were mostly gas-fired engines, but on the other hand, old units ceased operation as their lifespan ended. The use of renewable energies in combined heat and power provides the opportunity to further improve its environmental performance. In 2008, renewable energy sources provided 5.6 % of the fuel input in CHP, whereby we need to be aware that fuel consumption of CHP units includes total coal consumption of the Šoštanj Thermal Power Plant that partially operates in CHP mode. This share is the same as the highest share that was achieved in 2004. The increase as regards 2007 is the result of the co-incineration of wood biomass in the Ljubljana Combined Heat and Power Plant and the noted increase in the consumption of biogas. The share of lignite in fuel consumption amounted to 68 %. It is followed by brown coal (15 %) which is used by the Ljubljana Combined Heat and Power Plant, natural gas (11 %) and liquid fuels (0.3 %). The survey conducted among potential investors in 2006 regarding the possibilities and obstacles for the development of cogeneration showed that the investors see the biggest obstacle lying in uncertain prices of natural gas or the relation between the price of electricity and natural gas. Additional obstacles are the poor economic indicators of CHP projects (low profitability or long repayment period) and high initial costs or the as such related ensuring of financial resources (Jožef Stefan Institute, 2007). The main instrument for facilitating cogeneration of electricity and heat, the system of guaranteed purchase prices or premiums for releasing the produced electricity to the network or independent sale on the electricity market, was reshaped in 2009, partially also due to poor results in facilitating autoproduction. The Government adopted the Regulation in May 2009 and it entered into force in November when it was confirmed by the European Commission. The new system implements two possibilities of support, i.e. the guaranteed purchase of electricity and operational support. The right to choose the type of support (GP or OS) is given to CHP units with nominal power below 1 MW, while larger systems receive operating support. The new system includes the units in a support scheme which will give new impetus to the sector. On the other hand, there were a lot of new units constructed in district heating and agriculture in the past, so projections have already been exceeded while the new system maintained the encouraging environment. The position of CHP is determined also by other mechanisms (certificates of origin, investigations into technical and economic possibilities for constructing a CHP unit upon the granting of authorisations for thermal power plants or combined heat and power plants of a nominal power above 1 MW, etc.) and the advantageous loans provided by the Eco Fund, while we also need to mention trading with GHG emissions, where due to their specifics, CHP units are treated differently in the granting of allowances. A special characteristic of CHP is that on-site emissions increase but as more product is generated per unit of input energy, emissions at the state level decrease. The analysis of possibilities of using cogeneration in Slovenia, which was conducted pursuant to the requirements set forth by Directive 2004/8/EC on the promotion of cogeneration and which considers the plans of operators of these units, has shown that the implementation of the planned measures aimed at promoting CHP, which are determined by the Operational Programme for Limiting Greenhouse Gas Emissions by 2012, would allow us to increase electricity production by 552 GWh by the year 2010. 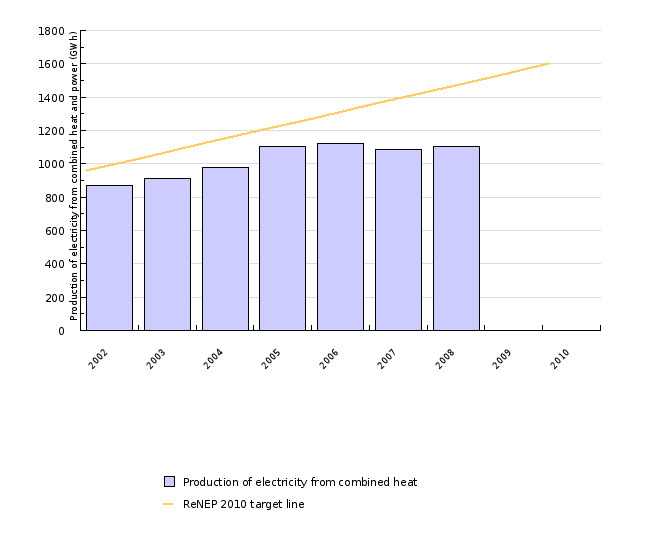 In this manner, we would produce 1657 GWh in 2010, which minimally exceeds the target determined in the Resolution on the National Energy Programme (Jožef Stefan Institute, 2007). 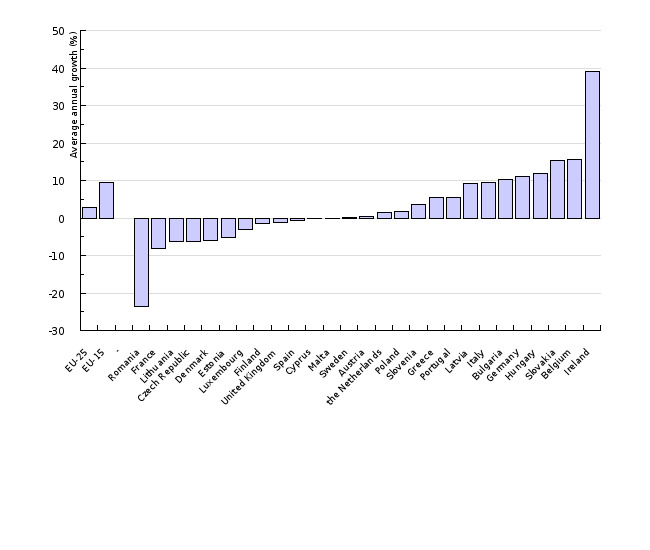 In 2007, the share of CHP in electricity production in the EU-25 was 10.9 %, while in the EU-15 it was 10.3 %. 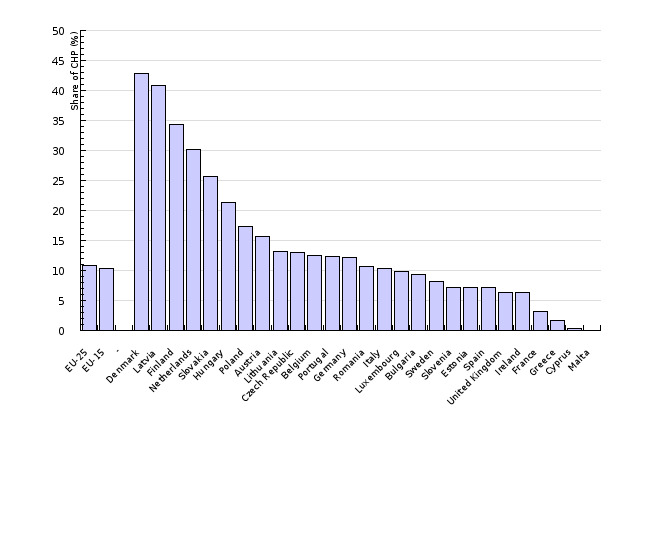 As evident from the Figure, Slovenia is below the EU average. It is encouraging that the 4.0 % average annual growth of electricity production in CHP units in Slovenia in the 2004-2007 period is higher than that in the EU-25 and the EU-15 countries (2.2 % and 2.7 % respectively). Less encouraging however is the comparison for the year 2007, as production in Slovenia decreased, while it increased in both the EU-15 and the EU-25 countries. Objectives summarised by: Resolucija o Nacionalnem energetskem programu (Resolution on the National Energy Programme, ReNEP, OG RS, No. 57/04). Source database or source: Data on electricity and heat production and the use of fuels in CHP units were used for the indicator; the data were communicated by the Statistical Office of the Republic of Slovenia. Furthermore, data on ECHP gross electricity production for the period 2002-2008 were also used. The data before 2002 are not usable due to a new methodology. For a comparison of Slovenia with the EU, the data of EUROSTAT were used, which were published in the publication Data in focus, Combined Heat and Power (CHP) in the EU, Turkey and Norway – 2007 data - Issue number 28/2009 in Combined Heat and Power (CHP) in the EU, Bulgaria, Romania and Turkey - 2004 data and data on the share of generated electricity in CHP plants in the total electricity production (Combined heat and power generation - Percentage of gross electricity generation Energy and the Environment), which is indicated among the structural indicators (Structural indicators > Environment > Combined heat and power generation). Methodology and frequency of data collection for the indicator: The data on combined heat and power generation were prepared in accordance with EUROSTAT methodology, which determines two different ways of calculating the electricity production in CHP plants with regard to the total efficiency of the power plant. If the average annual efficiency (heat and power generation) is higher than 75 %, then all electricity is considered as CHP production. If the efficiency is lower, then the electricity production from CHP plants is calculated by multiplying the CHP heat production by the characteristic power-to-heat ratio of the plant. The data of SORS are not published; however, the data of EUROSTAT were published in publications, accessible through the Internet. Data collection is conducted on an annual basis. The data on CHP exist for Slovenia for the period 2002-2008. The data for the EU-27 are available for 2002 and 2004-2007. Data processing methodology: Average annual rate of growth of electricity use is calculated as [(last year/base year) ^ (1/number of years) –1]*100. The share of electricity production from CHP plants in the total electricity production was calculated as a quotient of gross electricity production in CHP plants and the total electricity production in Slovenia (See EN17, Electricity production by fuel). Geographical coverage: The EU-25 includes the following EU Member States: Austria, Belgium, Cyprus, the Czech Republic, Denmark, Estonia, Finland, France, Germany, Greece, Hungary, Italy, Latvia, Lithuania, Luxembourg, Malta, the Netherlands, Poland, Portugal, Republic of Ireland, Slovakia, Slovenia, Spain, Sweden, and the United Kingdom. The EU-15 is composed of the older EU Member States: Austria, Belgium, Denmark, Finland, France, Germany, Greece, Ireland, Italy, Luxembourg, the Netherlands, Portugal, Spain, Sweden, the United Kingdom. - Advantages and disadvantages of the indicator: For the calculation of the indicator, the officially reported data were used, which were calculated on the basis of an internationally confirmed methodology. - EEA, 2007. EN20 Combined Heat and Power (CHP). - EUROSTAT, 2009. Combined Heat and Power (CHP) in the EU, Turkey, and Norway – 2007 data. - IJS, 2007. Potential analysis for the use of high-efficiency heat and electricity cogeneration in Slovenia; Report to the European Commission in accordance with Article 6 and Annex 4 of the Directive 2004/8/EC on the promotion of cogeneration based on a useful heat demand. - Uredba o podporah električni energiji, proizvedeni v soproizvodnji toplote in električne energije z visokim izkoristkom (Regulation on supports for the electricity generated in cogeneration with high efficiency, Official Gazette of the RS, No. 37/09, 53/09, 68/09, 76/09).